KUALA LUMPUR, OCTOBER 2016 – The hotel associates from Berjaya Times Square Hotel, Kuala Lumpur recently brought joy and smiles to the 40 Orang Asli children studying at Tadika Kemas Jakoa, a pre-school set up for the Orang Asli community in Gombak. Berjaya Times Square Hotel, Kuala Lumpur’s Corporate Social Responsibility program (CSR) for the month of October was championed by the hotel’s Front Office department. The group of 30, made up of associates from different departments within the hotel arrived at the pre-school at 9.30am and had a sumptuous breakfast feast with the children and their teachers. After breakfast, the children continued on with the day’s lesson while the associates get started on the repair and renovation works. The peeling and discoloured walls outside the main gate was stripped clean and given a fresh coat of grey paint by the first team while the second team tended to the small garden beside the pre-school. The associates spruced up the garden by planting chillies, tomatoes and lady fingers’. The children will take care of the crops as part of their outdoor activities. The repairs and renovation works ended around 3 pm which was followed by a hearty and healthy lunch, specially prepared by the hotel’s kitchen department for the growing children. The hotel associates and children then spent the rest of the afternoon engaging in fun activities such as musical chairs before moving to the main highlight of the day which was the presentation of gifts for the children. All 40 children in Tadika Kemas Jakoa were presented with new bags, stationeries as well as toys. In addition to that, the associates of Berjaya Times Square Hotel, Kuala Lumpur also prepared a sweet surprised for the children in the form of a delicious chocolate cake topped with glazed fruits and marshmallows. The giant chocolate cake was for all the birthday boys and girls in the school. 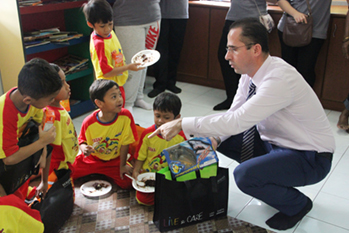 “We are delighted to bring cheer and warmth to the children of Tadika Kemas Jakoa with our latest Corporate Social Responsibility (CSR) activity. 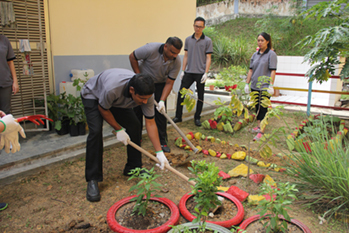 This activity is part of our continuous effort in reaching out to a wider cross section of the community through a series of CSR initiatives which we organized throughout the year”, said Mondi Mecja, Area General Manager of Berjaya Times Square Hotel, Kuala Lumpur. “We truly enjoyed spending the day with the children at Tadika Kemas Jakoa. Besides that, we also had a great talk with the teachers working selflessly each day educating the children in the Orang Asli Community. We were able to hear first-hand on the challenges that they are facing and we hope to be able to come back again next time and be of assistance again”, he added. Tadika Kemas Jakoa is a part of Jabatan Kemajuan Orang Asli and is located at Bt 12 Gombak, Kuala Lumpur, Malaysia. The school currently has Orang Asli children between the ages of 5-7 enrolled in it. For more information or donation enquiries, please head over to http://www.jakoa.gov.my/.